"Remember when" is a phrase we've all heard before. It's a wistful place that remains in memory, until someone decides to bring some of the magic back. We created Harken Barrel Fermented Chardonnay to do just that. We missed the toasty notes and buttery finish of the rich, oaky Chardonnays from the good ol' days. So here's to bringing it back in an even better way. Harken is a blissful throwback that's all about the simple joy of making memories with friends and family. We started from remembering the good times and we want to help make more.Only the finest California grapes make their way into Harken Wines. We find a bunch of these dazzling grapes in the Arroyo Seco AVA of Salinas Valley. The unique features of this small but diverse grape-growing paradise create a magical blend of depth and character. 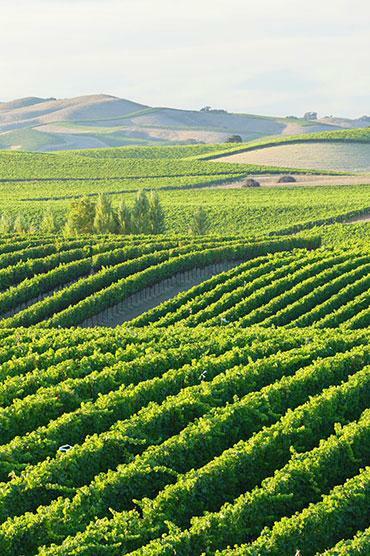 With the Santa Lucia Mountains rising to the west and Monterey Bay to the north, Salinas Valley is nestled in a coveted area of ideal climate and growing conditions. We're delighted to have access to this small, exclusive region for the most beautiful Chardonnay grapes. We're even more delighted to share them with you!